tapestry316: Chasing Fall before Winter arrives! Well, the days are still nice here - but our nights are getting colder. Even though we don't have the dramatic color changes on the leaves out here, Fall still has its lovely moments. You just have to look quick and paint fast! There are still lots of pumpkins to be had around here, but most of the colorful leaves have slipped off the trees. We are hanging on to a bit of the summer, too, in my watercolor class. This week we started painting a beautiful red rose. Note that I said started. This will be red eventually... I am still working on getting richer colors in my first washes. Ahem. It's not the quality of my paint, but rather the way I mix it. You have heard me say over and over - use the best materials you can afford in order to get the best results. 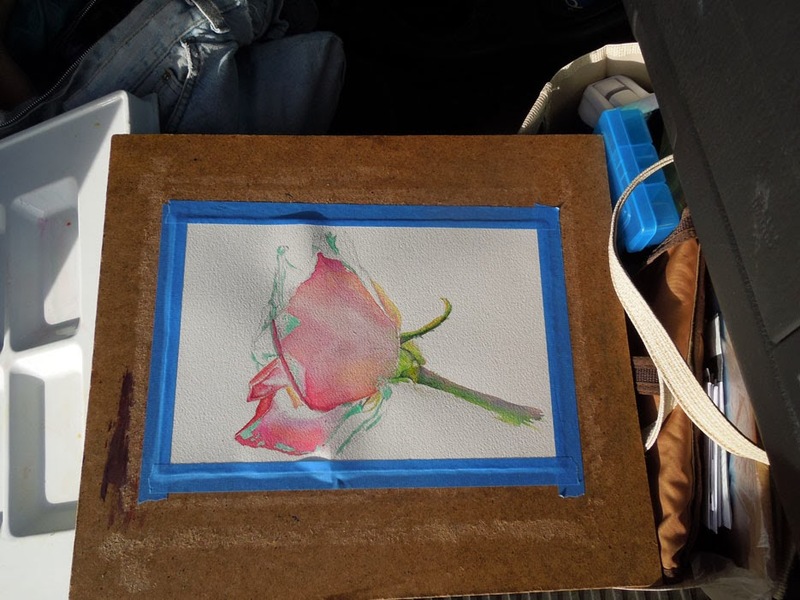 These are rich artist grade watercolors, but mixing up a big puddle of color is not as easy as Caroline Linscott makes it look! LOL However, I am enjoying practicing - a lot. 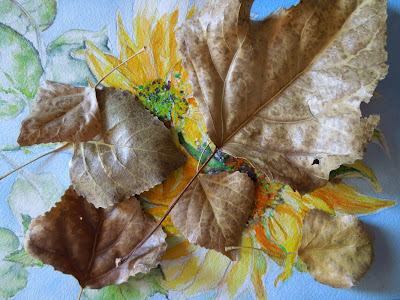 I still have my little sunflower painting - but now I also have some pretty cool dry Cottonwood leaves, too. And I have a few ideas for some more fun ACEO paintings featuring them. If you want to see a little bit more of what I am going to try, check out Caroline's book, "Watercolor 1, Learn the basics of watercolor painting". The book is full of great photos, easy to follow directions and lots of her artwork. 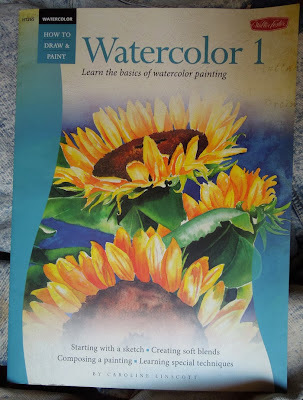 So, in honor of the last vestiges of Fall, I am diving into painting (indoors!) some of the splendid colors that are now just a memory around here. Hope you are enjoying the changing seasons wherever you are, too! Welcome to another great Blogging Business Artisans Challenge! This Blog post features a challenge from Edi at Memories for Life. November- Memories for Life - Fall Colors The leaves are changing (or already changed) and the weather is cooling off. Before we head into winter, create one last piece with the beautiful colors of fall! Find inspiration in the nature around you. Can't wait to see the finished rose but (sigh) I have no choice, do I. Cute ACEOs! And I can't wait to see your rose complete as well! Thank you! Hopefully I will make some good progress next week! Thank you! Taking classes is fun, for sure. I am really enjoying this watercolor class! 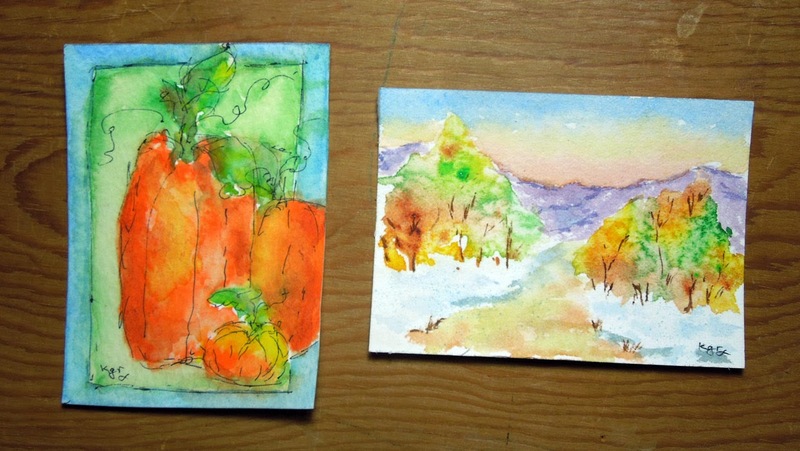 Beautiful fall ACEOs! Your rose is looking good! it will get redder with every wash. Oh, crispy crunchy leaves...have fun! That shot of the Cottonwood leaves on top of the sunflower painting looks like the beginning of a collage - or a layered painting..........cool! I am really enjoying learning this process. The washes are a lot of water with small amounts of paint - but the colors that she uses really surprises me sometimes. With transparent watercolor, you can keep putting on more and more washes - as long as you let them dry completely in between. She has lots of hints in her book. I saw a copy at Hobby Lobby today when my sister and I were out shopping. We are using Arches 140 pound cold press - that is what Caroline recommends. She also said that Fabriano makes a lovely 140 pound cold press paper. I have used that, too, and it is as nice as Arches paper is. The better the paper, paint, and brushes, the better your painting and your painting experience will be. There's such joy in your words as you describe the process of learning something new. Make sure you show us that rose when you're done! Thank you - I do love to learn new things. I will keep you all posted on my progress! I bet your rose will turn out beautiful too! Love your sunflower! Thank you, Pam! I get to paint on it at class tomorrow.